Little things make a big difference when you’re putting together a resume. Choices about formatting affect the overall impression your application makes on the hiring manager. Font choice and size, spacing issues, even settings for margins can all change the way your resume is perceived. It's important to use standard resume margin guidelines when formatting your resume. This way your resume will look professional and will be properly laid out on the page. What are standard margin guidelines? Read on for all the information you’ll need about margins, text alignment, and how to reduce margins if you need extra space. Resume margins should be about 1-inch on all sides. You can reduce the margins if you need extra space, but do not make them smaller than ½-inch. If the margins are too small, your resume will look too busy. Why would someone be tempted to shrink the margins down smaller than ½-inch on all sides? To fit all their information on one page. Fortunately, most career experts now agree that it’s OK to retire the old rule that resumes should be kept to one page only. While it’s in your best interests to keep your CV snappy and to the point, if you legitimately need more than one page to show off your accomplishments, go ahead. 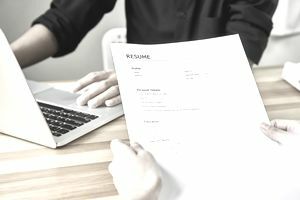 The most important thing is that your resume contains only the information that’s relevant to the job posting and likely to catch the attention of the hiring manager. Tinkering with margins to fit more info in a smaller space won’t accomplish those goals. You should also align your text to the left (rather than centering your text); this is how most documents are aligned, so it will make your resume easier to read. Typically, the left side of the resume contains the most important information, such as your previous employers, job titles, and your achievements and/or responsibilities. Resumes often contain additional information on the right side of the page, such as dates and/or job locations. This creates a visually balanced resume. Thinking about mixing it up for your next resume draft? Think twice. Research has shown that 70 percent of employers prefer standard resumes, even for creative jobs. So while infographic CVs or video resumes might get a lot of attention from the media, they might not get you the interview you seek. Why is that? Well, in part it’s because most people are not skilled graphic/multimedia artists in addition to their many other professional skills. It’s harder than you might think, even with the technology available today, to make a creative resume that effectively communicates your message. More often, the bells and whistles merely detract from your qualifications. Finally, creative resumes have one big disadvantage: they’re hard for robots to read. If you’re submitting your application through an online process, you’re almost always better off to stick with the traditional resume format and a Word document or PDF. You can adjust all the margins (left, right, top and bottom) from this window. When you have a choice, use standard settings for your resume format. That applies to margin sizes, fonts, and other formatting issues. Hiring managers are used to seeing 1-inch margins, for example. Stray from the formula, and you run the risk that they’ll notice your formatting choices and not the content of your CV – not your goal. The good news is that these choices are usually easiest to make: word processing software tends to come with these settings built-in. Remember that robots are even more finicky than human readers. If you apply for a job online, your resume will most likely go through an applicant tracking system. Use non-standard formatting, and it might never make it to human eyes. Review resume examples and templates before you get started. This will help you to see formatting choices in action, as well as providing you with some style options you might not have considered otherwise.